Advanced Navigation, a leading developer of high accuracy navigation technologies, has partnered with Unmanned Systems Technology (“UST”) to demonstrate their expertise in this field. The ‘Platinum’ profile highlights how their MEMS (Micro Electro-Mechanical systems), FOG (Fiber Optic Gyro) and acoustic positioning based navigation products can be used for a wide variety of unmanned vehicle platforms, including UAVs (unmanned aerial vehicles), UGVs (unmanned ground vehicles) and AUVs/UUVs (unmanned underwater vehicles). 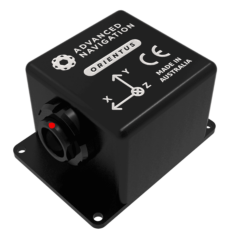 Orientus is a ruggedized miniature orientation sensor and AHRS (Attitude & Heading Reference System) that combines temperature calibrated MEMS accelerometers, gyroscopes and magnetometers using a state-of-the-art fusion algorithm to deliver accurate and reliable orientation in even the most demanding environments. It features advanced filtering that detects and adjusts for magnetic interference, and a sophisticated algorithm that compensates for short-term linear accelerations, allowing the sensor to maintain accurate roll and pitch measurement. Orientus is enclosed in a precision-machined marine grade aluminium enclosure, and its minimal size, weight and power requirements make it ideal for unmanned vehicle applications such as platform and camera stabilization, as well as a heading reference source for unmanned surface vehicles. Motus is a miniature ultra-high accuracy MEMS IMU (inertial measurement unit) that combines ultra-high accuracy accelerometers and gyroscopes with magnetometers to provide inertial performance that exceeds even some FOG IMUs. With a volume of just over 1 cubic inch and a weight of 26 grams, Motus is ideal for SWaP-conscious applications, such as geopointing and LiDAR missions with VTOL UAVs. The system is available in an OEM package suitable for integration into larger products, or an enclosed package for external and standalone use. 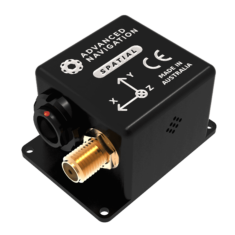 Spatial is a ruggedized miniature GPS-aided INS (inertial navigation system) and AHRS that provides accurate position, velocity, acceleration and orientation outputs. 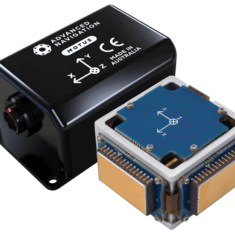 It couples high-performance MEMS inertial sensors and a pressure sensor with an advanced GNSS receiver using an AI-driven fusion algorithm to deliver accurate and reliable navigation and orientation. Spatial’s GNSS receiver supports all current and future satellite navigation systems including GPS, GLONASS, GALILEO and BeiDou. It features L1 RTK which can provide positioning accuracy of 2cm and also supports kinematic post-processing accuracy of 1cm. 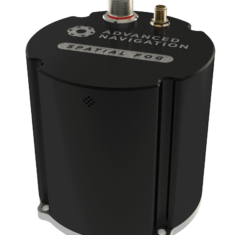 A next generation battery backup system allows Spatial to hot start inertial navigation from its last position in 500 milliseconds and obtain a GNSS fix in approximately 3 seconds. Spatial FOG is a ruggedized GPS-aided INS and AHRS that combines ultra-high accuracy fibre optic gyroscopes, accelerometers, magnetometers and a pressure sensor with an RTK GNSS receiver. The integrated KVH Industries 1750 FOG IMU provides extremely accurate inertial data and allows Spatial FOG to achieve very high accuracies and dead reckon without GNSS for extended periods of time. Spatial FOG’s triple frequency Trimble RTK GNSS receiver provides up to 8mm accuracy positioning and supports all of the current and future satellite navigation systems. Extremely low drift rates make Spatial FOG an ideal choice for high-accuracy unmanned vehicle navigation in GNSS-denied environments, as well as UAV geo-referencing and surveying applications. 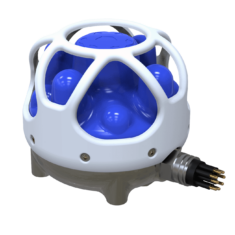 Subsonus is a next-generation USBL underwater acoustic positioning system combining an eight channel factory calibrated hydrophone array with an internal tightly coupled INS. Capable of operating at depths of up to 1000 metres, it fuses acoustic position and doppler velocity with factory calibrated inertial sensors and a depth sensor, providing highly accurate position, velocity and heading outputs. Subsonus dynamically adjusts its acoustic transmit power based upon ranging distance, resulting in highly improved short range performance by significantly reducing noise and multipath. The system is ideal for station keeping, control and subsea surveying applications for both AUVs (autonomous underwater vehicles) and ROVs (remotely operated vehicles).